I would like to preface by saying that while the Olympics are on, i will, most likely...actually, certainly, neglect my blog. I could happily watch 16 days of competition in my pj's and forget about every other facet of my life... how often do we get thrown such an array of events? 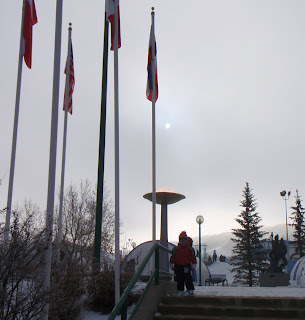 And well, since we have ski jump, bobsled, skeleton and luge tracks at our disposal, perhaps we'll be seeing one of our kiddos at the 2022 games? I have been asked by a few fellow bloggers what I actually thought about our opening ceremonies. I guess i would happily assume that you all saw the same splendid displays that i watched; however i know that is not true. Rita @ One2Try, has a hubby who was a cameraman for the event. He told her things to watch for, on the week leading up to the ceremony. Did she see any of that?? NO. Apparently, the opening ceremony was terribly chopped and edited for you fellow Americans. While you may have seen totems, did you actually see them come out of the floor?? Our visuals (think whales and salmon swimming across the floor) and our music (think Ashley MacIssac and our tatted fiddlers) were stunning and unique. I *think* we gave the world a pretty good glimpse into Canadian culture. Our First Nations have been given all controlling rights for these games, a first ever in history. After all, they were here first. We are a truly multicultural country- proud and strong. Not too many out there quite like us! I will say though, i am a little miffed at where we left our French connections this ceremony? (aside from the language) But ah--that's just one more 'healthy' thing for us to argue about for the next few decades. Did YOU like our opening ceremony? Games on!...Good Luck to All of your respective countries! Visit Unknown Mami and the rest of the gang, to see what is up this Valentine's Sunday! I did not watch the ceremony, live or otherwise, just seeing the bits on the news. I liked what I saw, but am not into the big cermony thing. It is interesting to me to read some of the generalisations you make about Canadians. YOu note some of the same characteristics I would claim for Australians, especially the self-deprecating humour. Thank you for this post. I enjoyed reading your take on the games and on your society. Yes, well actually, Aussie's in our country love it here...for those same reasons! And we seem to have a strong fancy for those Aussie's as well! Yep, I watched the opening ceremonies and my first thought was that NBC had "peeked" too much of that gorgeous opening downhill snowboarding video. It didn't feel fresh to me--- BUT, then the native indian parts came on and I loved the way the camera angle shot straight down and you could see the "drum" beat/pulse on the various tribe symbols. I'll be glued tot he tv watching for the next 2 weeks too. 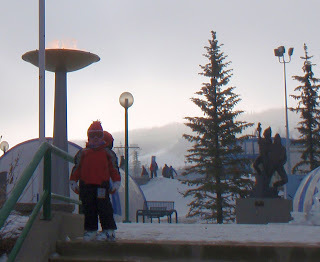 I loved the opening ceremonies---I actually wrote about it today. I wish I could have seen the rising totems, though. Oh my gosh, a bobsledding track. Do they have a "tame" one? I really enjoyed it (and let Andrew stay up until 10:30 to watch Team Canada march into the stadium). I had quite a few teary moments, including Rick Hansen's entrance, the flags being raised, then lowered to half staff, KD Lang singing, seeing Betty Fox carrying the flag, seeing Donald Sutherland looking actually kinda teary over carrying the flag, and, of course, the Gov. General proclaiming the games "Open". 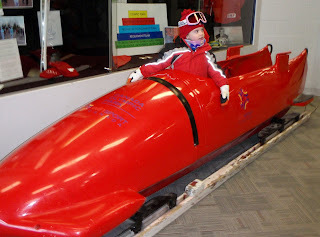 A pro bobsled driver will take you down for runs...about $165.00 per person. Murray and kirsten watched the ceremony the next morning and both talked about how spectacular it was. Unfortunately I was snoring it up in my bed, but I have been watching some of the events! Although we have to rely mostly o. Highlights because of the time difference. I'm thinking the First Nation stuff was awesome, but it was all good. I loved everything - and cried thru most of it - such beautiful moments when the "whole world" comes together to PARTY and CELEBRATE! Amazing, really . . .
- the snowboarding at the beginning - WOW'zer! People REALLY do that off the side of MOUNTAINS? Was that for real?! - the WHALES "swimming" - good night! all those spec effects were amazing! - the totem poles coming up - we saw it all! - kd lang singing Hallelujah! - what an amazing song and voice! The only minus for me - the opera singer's song - I couldn't understand ONE WORD!!! We were trying to guess what lang she was singing in! HA! no tv here so i didn't see them...but i'd go for a bob sled ride anyday! I actualyl did not see it! I watch everynight to see how the dutch speed skaters are doing but thats about it. Im such a bad olympic follower! The Opera singer was singing in Greek....i believe. I think that is a traditional Greek poem read at every Olympic games. Don't quote me on that, but i'm pretty sure. I was thinking about you and all my Canadian blogging peeps while watching. Happy Canada is doing well with a Gold! Your enthusiasm and pride are contagious!